Economy Series feature an all-angle frame, with a 4′ landscape gate, treated wood floor, and stud-mounted lighting. Running gear is spring suspension 3,500 lb. axles with radial tires. 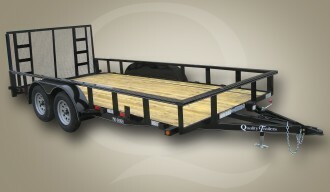 This trailer is available with one brake axle or two brake axles. There is no reflective tape on Economy models. The main frame is 3x3x3/16 angle iron with a 2x2x1/8 angle top rail and a 4″ channel non-wrap-around tongue. This model is available in 16′ and 18′ lengths. General Duty models feature an upgraded all-angle frame. The main frame is 3x3x3/16 angle iron with heavy duty 3x3x3/16 angle top rails and uprights, 3″ channel crossmembers, and a 4″ channel wrap-around tongue. Running gear is spring suspension 3,500 lb. axles with 4-wheel brakes and radial tires. A 4′ landscape gate, and a standard 2′ dovetail make loading lawn equipment easy. A treated wood floor, stud-mounted lighting, and skip reflective tape are standard. General Duty models are available in 16′, 18′, and 20′ lengths in 7,000, 8,000, and 10,000 GVW ratings. Professional Grade models feature a heavy duty angle iron bottom frame with rectangular tubing top rails. The main frame is 3x3x3/16 angle iron with a 3×2 tubing top rail, 3″ channel crossmembers, and a 4″ channel wrap-around tongue. A 10,000 GVWR model features increased main frame tongue and crossmember upgrades. Running gear is spring suspension 3,500 lb. axles with 4-wheel brakes and upgraded radial tires. A 4′ landscape gate, and a standard 2′ dovetail make loading lawn equipment easy. A sealed wiring harness with all LED lighting and full reflective tape comprise the upgraded lighting package. We also add steps to the front and rear of the fenders. Professional Grade models are available in 16′, 18′, and 20′ lengths in 7,000, 8,000, and 10,000 GVW ratings.